This is part six of a twelve part-installment of a Beard and Stache special where we'll be breaking down the top things that each lottery team needs to accomplish this offseason in order to improve heading into the 2012-13 campaign. We covered the Cleveland Cavaliers in yesterday's edition, which can be found here. We now migrate from Sacramento, California to Portland, Oregon to dive into a team that goes through more general managers than Greg Oden undergoes surgeries -- the Portland Trail Blazers. Bring the UNC duo to Rip-City. It shouldn't be too long until the campaigning outside new general manager Neil Olshey's office begins. At 6'4", Marshall would be a perfect fit in Portland -- a pass-first floor general with exceptional size for the position who could spread the ball around to All-Star forward LaMarcus Aldridge and young french swingman Nicolas Batum. Marshall reminds me a lot of another former Blazer in Andre Miller. Not overly flashy or athletic, but a bigger point guard with a high basketball IQ who could run the show in Portland for years to come. As for Zeller, he's arguably one of the most polished big men in the draft. At 7'0" 250 lbs., he's mature from a physical standpoint and those four years at one of the greatest basketball universities on the planet should help Zeller make a fairly easy transition to the NBA. His Tar Heel teammate would already come into the league with great chemistry, the importance of which can never be underestimated. Marshall to Zeller will become a combo Blazers fans won't soon forget. At this point, Batum seems intent on testing the free agent waters as a restricted free agent (meaning the Blazers have the opportunity to match any offer he's signed to or receive a compensatory draft pick should he bolt). He may still end up back in Rip-City, but not before teams like the Spurs ( thanks to the draw of fellow Frenchman Tony Parker) and many others have their chance to make an offer. It's rumored that Batum wants a hasty resolution to the whole free agency process, so don't expect for the dominoes to take too long to fall, whether it's back with Portland or somewhere else. Outside of Aldrige, Batum is probably the best player on Portland's roster. They have the room to keep him, so they need to do so. Congratulations, Portland. Shedding the contracts of Thabeet, Felton and Flynn has netted the team around $16 million in cap space heading into free agency. Sadly, there are no top-flight free agents to be had outside of Deron Williams, but at least you have the money to re-sign Batum and cap flexibility for the future, which is never a bad thing. 4. Aldridge is Your Star, Feed That Man the Rock! Aldrdge is one of the best young big men in the NBA right now. Getting him the ball is never a bad thing. If it were me, I wouldn't let a single half-court offensive possession go by without getting LaMarcus at least one touch. Not only does he have a stellar mid-range game, but he's also developed a plethora of back-to-the-basket post moves. Given enough opportunities, I think LA could average somewhere around 25 points and 10 rebounds a game no problem. 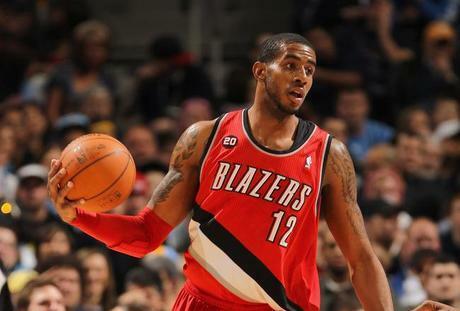 Aldridge is an All-Star, and the Trail Blazers would be wise to never the let the rest of the league forget it. 5. Can We Get Some Stability, Please?!? It would be nice to see a general manager last for more than a season. Not to mention, after terminating head coach Nate McMillan, the Blazers removed one of their few remaining 'concrete guys' left in the organization. Take your time with your coaching search and make sure you find a candidate that can stick. The Blazers need to be more like the Pittsburgh Steelers and less like the Cleveland Browns in the head coach department moving forward.